IVINS — The Center for the Arts at Kayenta is putting a Wild West twist on the treasured classic “Much Ado About Nothing” by William Shakespeare. The play will have multiple showings this Thursday-Saturday in Ivins. Combining the talents of professional artists, local favorites and student actors, this production features a vibrant fusion of storytelling that is guaranteed to please audiences and leave them rolling in the aisles with laughter. Shakespeare’s beloved characters, Beatrice and Benedick, match wits in a Wild West adaptation of the hit romantic comedy. The project, conceived by Rich Hill and Zac Trotter, theater teachers at Hurricane and Cedar high schools, respectively, wanted to find a way to utilize the great skills and strong talent found right here in Southern Utah. With their students in mind, the production provided the opportunity for recently graduated high school students to gain additional experience and “a leg up” as they head into their college and career endeavors. 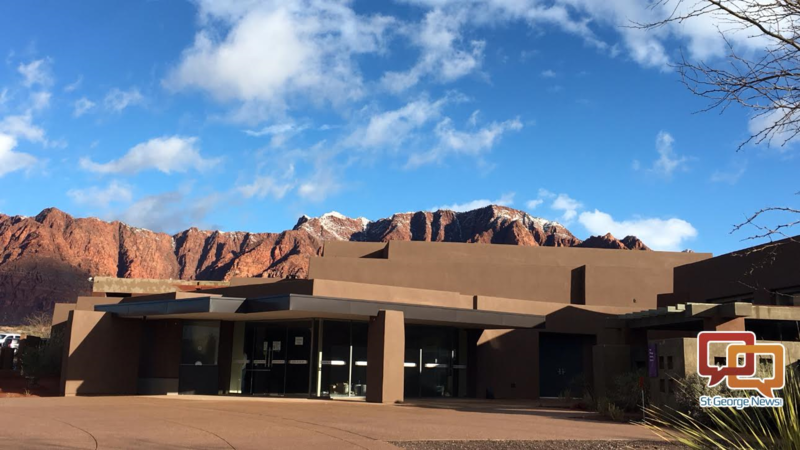 The production will play at the new Center for the Arts at Kayenta, a beautiful new space right in the heart of Ivins featuring the dramatic western red rock landscape used by so many western movies of the past. The production’s concept aligns perfectly with the area and patrons who have come to love what Kayenta offers. Prior to opening at the Center for the Arts at Kayenta, the play was featured July 27-28 at the Bumbleberry Playhouse in Springdale, a small rustic space that incorporated the audience into the storytelling and included a dinner/theater option in cooperation with Porter’s Smokehouse and Grill located right next door to the playhouse. Tickets are on sale now for evening showings Thursday-Saturday and one Saturday matinee at the Kayenta Center. Tickets can be purchased at the Center for the Arts at Kayenta website, by calling 435-674-2787 or at the box office, 881 Coyote Gulch Court, in Ivins. Admission is $30, and $10 student tickets are available. Use the promotional code “PINK” for a savings of $5. When: Thursday-Saturday, Aug. 9-11, 7:30 p.m. | Saturday matinee, Aug. 11, 2 p.m. Cost: $30; $10 student tickets are available. Use the promotional code “PINK” for a savings of $5. Purchase tickets: Online, at the box office or by calling 435-674-2787. Center for the Arts at Kayenta: Website.